How are elements missing from the database represented? The Autodesk Advance Steel database can be filled with new sections, bolts and anchors, which are used for modeling. Even though the model can be opened on a computer on which the new elements are not added in the database, the new elements are not properly represented, or some fields in the Advance Properties dialog are empty. For example, a new section (C101x2.1), a new class (C_new) and a user section (C_user) are added. If the model is opened on a computer on which these sections are not in the database, the representation and other properties are incorrect. •The section which is missing from database is displayed with the class specific form, but the dimension is incorrect and the section field in the Advance Properties dialog is empty. • The representation for the new class and for the user section is a triangle. • The bolts have the same representation, but the information is missing from the Advance Properties dialog. • The anchors have a modified representation. • The detail drawings which do not contain BOM on the drawing remain in the “Current” category, even if the model elements are not properly displayed. • The BOM on the drawing or the BOM generated from the model require an update, because the weight and surface have changed. 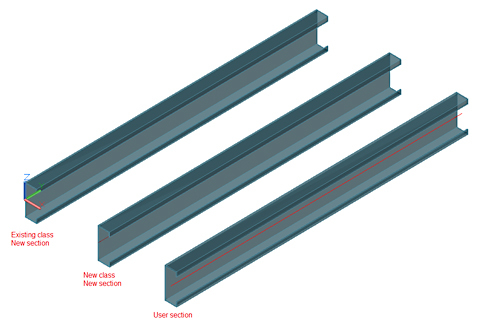 In a model, joints that are not from Autodesk Advance Steel installed database can be used. 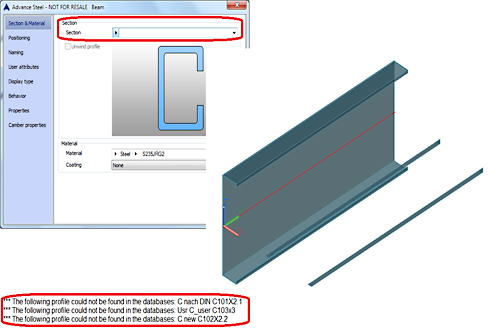 When the model is opened on a computer with the default database, the Advance Joint Properties dialog is empty.